I love when websites allow me to use an existing social login to log in to their content as well. That means fewer IDs and passwords to remember and I am all about that. What I don’t like is when the trade off for that convenience is giving the site permission to post content to my social media account. No! 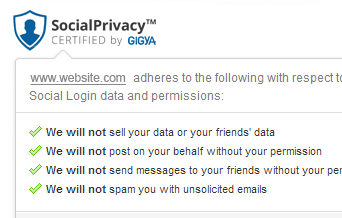 So here is something I want all the sites that I used to do: use the new privacy seal of approval from Gigya. The Social Privacy Certification Seal aims assures consumers like me that their activity won’t be blasted to their Facebook friends or Twitter followers without consent. To obtain a seal, publishers cannot sell user social data, post to social feeds without permission, engage in social data-based email marketing campaigns without permission, or send private messages to users’ friends without permission. A recent Gigya survey of around 2,600 Web users revealed that 41% of consumers don’t use a social log-in because they are worried that information about their Web activity will be shared with social networks. Nearly that many — 40% — said they don’t use social log-ins because they don’t know how their personal information will be used. The survey also found that 55% of users have logged in with social media credentials at least once, often because they don’t want to create new user names and passwords.